Although widely known for its furniture making and tobacco harvesting industries, North Carolina is also a state full of beautiful scenery from rugged mountains to warm sandy beaches. 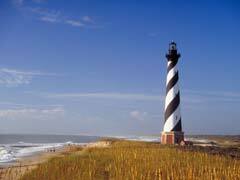 Adding to the state’s attraction are the many historical sites from the American Civil War and lighthouses aplenty, making a North Carolina vacation fun for the whole family. Asheville is a city nestled in the Western North Carolina mountains and offers visitors plenty of natural beauty accessed on trails, by zip line or on horseback. The Blue Ridge Parkway is a scenic drive that is full of stops for trails, waterfalls, and interesting rock formations to go along with the forested areas that each year are aglow in the splendid autumnal colors. 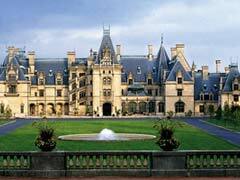 Asheville is home to America’s largest house, the Biltmore Estate a 250-room palatial home that was owned by the famous Vanderbilt’s. Today there are many different tours of the property and extensive adjoining gardens to enjoy and take in the grandeur of the manor. Over in the capital of Raleigh, your North Carolina vacation can include the Museum of Natural Sciences, where you can see a dinosaur with a fossilized heart, the skeleton of a massive whale and many other natural wonders. Not far from there is the Marbles Kids Museum, an interactive hands-on, indoor and outdoor play place for the kids to be kids with a strong emphasis on play of all types. For those Civil War history buffs, the Bentonville Battlefield State Historic Site is not to be missed. This old battlefield is left largely as it was, and includes the Harper House which was used as a field hospital, other structures and a graveyard. The Mordecai Historic Park has the birthplace of Andrew Johnson on site as well as other historical buildings and with a trolley stop right outside it has easy access to other historical sites in the area. Those traveling to North Carolina will want to check out the Capitol building, some say is the most haunted capitol in the country, set amid beautiful grounds, with tributes, monuments and statues. 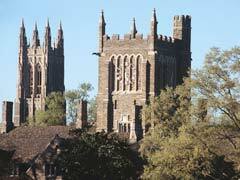 The home of Duke University as well as the Duke Homestead can be found in Durham. Here a North Carolina vacation can take you back in time as you visit the homestead to see how Washington Duke first grew and processed tobacco, leading to what would become The American Tobacco Company. The university that bears the name is an architectural marvel as visitors can take a campus tour and learn about it as well as the history of the area. The Civil War may have officially ended at the Appomattox Court House in Virginia, but the Bennett Place Historical Site is where the largest surrender of Confederate troops occurred. It just happened to be in the middle of the two sides, and today the re-constructed farm of James Bennett is of historical significance offering an educational and informative North Carolina tourist attraction. Charlotte is home to the US White Water Center, an exhilarating thrill ride for tourists and locals alike. Rafting, rock climbing, biking, hiking and a zip line are all activities visitors can partake in. If NASCAR is more your speed, and even if it isn’t, the Hall of Fame is still an interesting place to visit. Here, travelers to North Carolina can take in the cars, exhibits, artifacts, trophies and simulator rides to get an inside look at the world of NASCAR. Carowinds Amusement Park offers tourists lots of high paced thrills with its many roller coasters, while the Carolinas Aviation Museum is a quieter change of pace, home to many aircraft, including the one that landed miraculously on the Hudson River. Taking a horse drawn trolley tour through the Wilmington Historical District allows visitors to take in all of the beautiful old houses, churches, streets and the boardwalk along with lovely views of the water. The Fort Fisher State Historic Site is home to the remains of the fort along with lovely views of the Cape Fear River where visitors can learn about the history of the fort and the area. The Outer Banks is a 200 mile long strip of barrier islands off of North Carolina’s coast that is a must for any North Carolina vacation. There are many historic Outer Banks lighthouses on the islands including the one at Cape Hatteras which is the tallest in the U.S., the lighthouse at Cape Lookout is which fully functional around the clock, and the Currituck Beach one that is designed in Gothic Revival architecture. Old Baldy on Bald Island is out of service today, but still makes for a great North Carolina tourist attraction, on a quiet island accessible by ferry from the mainland. Kill Devil Hills is home to the Wright Brothers National Memorial, close to where their first flight occurred. Today there is a museum dedicated to their lives and a replica of their first plane. When traveling between North and South Carolina, you can’t miss (literally!) the South of the Border rest stop. Pedro, the well-known neon sign will guide you to this location that also includes gas stations, restaurants, a small amusement park and famous fireworks. Whatever the mood of your North Carolina vacation you are sure to find something that fits the bill, amid the lovely scenery and fascinating history of the area.